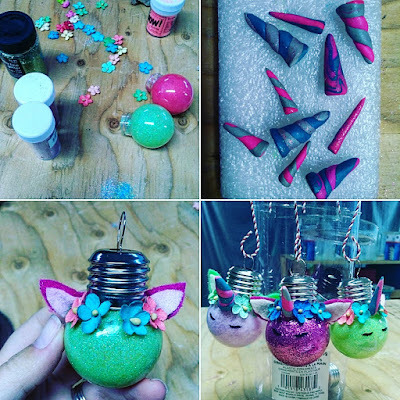 Nite Owl Creates: Unicorn Ornament Making! I've been seeing these cute unicorn ornaments on the various craft groups I am in on Facebook and thought they'd be fun to try making. My friend Wendy came over to help me set up for the Pinterest party and we sat down and started glittering these little ornaments I found at Michael's on Black Friday for half off. Love the size, small to work with but that also meant we were dealing with tiny clay horns, eyelashes and flowers. Glittering was really fun, I have lots of colors (also from Michaels) and we put that on the inside of the ornaments first and shook it around to evenly coat everything. That part was fun and fast. Next we worked on the horns, I had gotten some Sculpey clay from Michael's and it was relaxing to squish the clay around and shape it to the size that looked best. The tiny flowers I got at Michael's on Black Friday as well and they were perfect! I found the red and white hanger hooks at Michael's when we were in San Diego a couple weeks ago. The felt ears were the hardest to do and now that I think about it, I bet I could just cut them on my Cricut machine so I might play around with doing that.